With the summer season upon us millions of people will be hosting BBQs and grilling up juicy burgers for their friends and families as well as visiting restaurants to get a new taste of an old favorite. Did you know that “Hamburgers” is the 4th most popular menu type in the USA in terms of number of establishments? With over 49,000 restaurants they make up 7.4% of the American restaurant landscape. With hamburger restaurants being such a popular choice for Americans, you’ll want to get the latest information on the market potential for hamburgers. CHD Expert is home to the latest and most comprehensive data in the foodservice industry and we offer robust data reports for any menu type. If you would like to request information for this or a different menu type, contact us today! We’d love to speak to you about your specific needs. 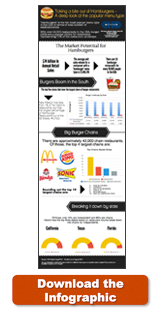 For those who would like more information about hamburger restaurants in the US, CHD Expert has created this infographic detailing the hamburger restaurant industry landscape.